Once you learn a few things about WordPress you’ll be able to update your own website pages. The system was designed to be easy to use. If you need help getting started with WordPress, I do WordPress coaching and I’ve written a book on the topic. WordPress uses plugins to add functionality to websites. (Plugins are to websites what apps are to cell phones.) There are thousands of free WordPress plugins. They help with things like website security, contact forms and slideshows. WordPress sites use themes to determine website layout and colors. There are many free themes that can be customized to give your site a unique look and feel. Most themes are designed to look good on mobile devices. Are there downsides to moving to WordPress? WordPress is a popular software system, so it’s the focus of more hacking attempts than hand-coded websites. Having a WordPress site means that you need to pay attention to things like website backups and updates. Speaking of updates, WordPress software needs to be updated on a regular basis. This includes updating the plugins and themes. You can do this yourself (my book tells you how) or I provide an inexpensive update service. 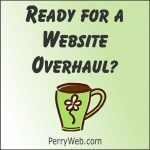 Does Moving to WordPress Mean That you Need a New Website Host? Most website hosts support these features. While you may need a new hosting plan, in most cases you can stay with your current website host. If you do need or want a new website host, I highly recommend SiteGround. They host this website as well as many of my customers’ sites. If you’re ready to make the move to WordPress or if you have additional questions, feel free to contact me. I’d love to help.